You can use admission ticket "pass which Yonezawa watches" common throughout advantageous Uesugi culture facility from June through November! It is available until November 30! You can purchase at Yonezawa Station tourist information center, Roadside Station Yonezawa, the following facility. 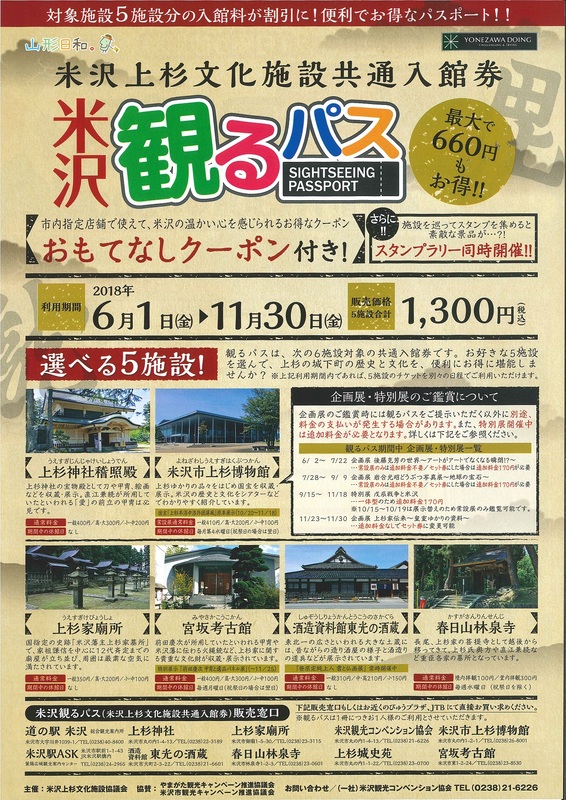 ☆It is recommended to castle town Yonezawa who wants to thoroughly enjoy history and culture of Uesugi! ☆Up to 660 yen becomes advantageous, too! Assorted Gifts of Yonezawa hits! You are advantageous, and please enjoy sightseeing of Yonezawa usefully! Armor of fly of love to be told that Prince Kanetsugu Naoe owned is must-see. It stores articles and national treasure related to Uesugi and displays. We introduce history and culture of Yonezawa clearly in theaters. madeno joss house shops stand in a row, and the neighborhood is met by solemn air. Precious cultural assets about person of Uesugi including matchlock store and are displayed. Tools of sake brewing are displayed. It becomes cemetery of chief vassal including Kanetsugu Naoe. This is constituted by main shaft. We perform display that took up writer and work related to native district. With common ticket, it becomes visit only for permanent exhibition. Temporary exhibition, plan exhibition costs additional charge. State of traditional liquor brewing and tool of sake brewing are displayed. Opening time from 9:00 a.m. to 4:30 p.m. It becomes Uesugi back room and cemetery of each chief vassal house including Kanetsugu Naoe. It stores important cultural property and displays. We can look at armor of "love" of Kanetsugu Naoe business here. We let you feel depth and dignity as you have shiver. It is store, museum displaying. Opening time from 10:00 a.m. to 5:00 p.m.
Country designated historic spot "Yonezawahanshu Uesugi's Tomb"
We put gobyosho and were guarded. Each generation feudal lord is buried on this ground afterward to 12 dai*teiko. kenshinkosommukuro of mortuary chapel in castle was performed transferring a body from a temporary shrine to a tomb of for nine years by our burial ground center. A lot of aged cedars more than 400 years years old are full of quietness in the precincts. Yonezawa citizen calls himself/herself "ladle and" (mausoleum). Visit time from 9:00 a.m. to 5:00 p.m.
2016-10-31 is "pass which Yonezawa watches" and observes Kasugayama Rinsenji. We observed by guidance of member of explanation in temple. We drift afterwards in CM of JR East. Shooting was prohibited in the temple, but is watched in CM. 2016-10-31 is "pass which Yonezawa watches" and observes Uesugi Shrine keishoden. Shooting is prohibited in the inside. There is "address of biography country" of Lord Yozan. We observe Yonezawa-shi Uesugi Museum with "pass which Yonezawa watches". We observe Uesugi burial ground with "pass to watch". "Prince Kenshin" carried at first by Echigo was dedicated to by Yonezawa Castle (current Uesugi Shrine, Kenshin Uesugi mortuary chapel trace), and, in the approach to a shrine to burial ground, it was in "Prince picturesque scenery" in the front as successive feudal lords were worshiped in burial ground by Prince picturesque scenery, but, in the days of Meiji, Uesugi Shrine was erected as enshrined deity by Yonezawa Shiromoto circle trace. With the Yonezawa Castle dismantling, corpse of Kenshin Uesugi laid in state in Yonezawa Castle was moved to burial ground in 1876. Furthermore, led by "Prince Kenshin," we changed approach to a shrine. There is monument of 14s "mokenko" which became the first Okinawa prefectural governor (the governor) next to "Prince Kagekatsu". It is lunch in "hideout of joss house" nearby. There is service of "dengaku" using coupon. Kura gap between the 420th anniversary of the foundation of 2017-9-9. Again this year "Prince Masamune Date birth 450 years"
Special display "possession, ukiyoe print exhibition"
Permanent exhibition "Uesugi Lord Yozan exhibition"
We observe Miyasaka Archaeology Museum with "pass which Yonezawa watches". Feudal lord whom Uesugi Lord Yozan left understands Denkoku-no-Mori (museum) and comes from "address of biography country", and there is facility of hall appreciating museum and performing arts of history. In permanent construction exhibition room including "Yozan theater" see, and touch, and can enjoy history of Yonezawa. It is culture hall appreciating performing arts. Seating capacity is equipped with stage of ability in about 500 people. "If you have a mind to do something, you can do it (if do it, can do it) ..." left "address of biography country". It is teaching to work in the present age. Uesugi Lord Yozan became world-famous in what we gave as person whom the Kennedy U.S. President respected. (2014)On September 27, 2014, Caroline Kennedy stationing in Japan U.S. Ambassador visited Yonezawa-shi and gave a speech, "the world should be changed alone" "(as for father, Former President Kennedy) and told." "if you have a mind to do something, you can do it in autumn festival" venue. Photograph of Caroline Kennedy stationing in Japan U.S. Ambassador at the time of visit is published in reception desk. There is monument of 14s "mokenko" which became the first Okinawa prefectural governor (the governor) next to "Prince Kagekatsu". We still keep Okinawa and close relations.